Prime Minister Sheikh Hasina on Friday blasted perpetrators of “prevent boat” campaign ahead of the elections in the yearend, questioning whether they want to install anti-liberation forces and war criminals in power. “There is a quarter in the country who doesn’t see any development and some are saying that the boat will have to be resisted. My question is —those who want to thwart the boat want to bring the Rajakars and war criminals in power,” she told a grand mass reception at the historic Suhrawadhy Udyan here this afternoon. up by eating the leftovers of the military rulers”. “Bangladesh has become self-reliant in food, entered the nuclear club, launched the first-ever satellite and brought down poverty to 22 percent as the people gave mandate in favour of the boat,” she said. Sheikh Hasina said flood may come in the middle of Bengali calendar months of “Sraban and Bhadra” when the politicians at least would need to get onboard the boats. “Won’t they get on board the boat at that time … they will require the boat at least to distribute relief,” she said. Asansole of India’s West Bengal. Parliamentary Deputy Leader of and Awami League’s senior Presidium member Syeda Sajeda Chowdhury presided over the function when party’s General Secretary and Road Transport Minister Obaidul Quader read out a citation or “obhinondon patra” congratulating the premier and party President on her chievements and handed it over to her. Senior leaders of the party were present on the dais. Earlier on her arrival at the venue at 3:30 pm, the premier was greeted by thousands of leaders and workers of Awami League and its associate bodies waving hands and miniature flags of their respective organisations. The prime minister pointed out that the “prevent boat” campaigners were now claiming “they will bring back democracy in the country”. “But if democracy doesn’t exist in the country how the people elected their candidates of choice by casting votes,” she asked. Sheikh Hasina said over six thousand elections including local government body polls were held in the last nine and a half years and the people elected their candidates through voting. “The voting rights of the people are now in their own hands,” she said. thin people were making such propaganda to misguide the people. the country’s existence and independence. The prime minister highlighted government’s tremendous successes in different sectors including resolving land boundary dispute and maritime dispute with the neighbouring countries, signing of Chittagong Hill Tracts Peace Treaty and Ganges Water Agreement. Sheikh Hasina said Bangabandhu first took initiatives for solving the land boundary dispute with India. The PM said a former prime minister when was in power forgot raising the issue of the Ganges Water Sharing when she visited India. “But Awami League doesn’t forget as the country, its existence and the rights of the people are bigger to it,” she said. Sheikh Hasina said her government achieved a huge success against militancy and terrorism of which seed was sowed by the BNP. “Now our operations against the narcotics are going on,” she said. Vowing to free the country, society and the youths from the curse of the drugs, the premier said her government wants to utilize the talent, thinking and strength of the youth properly to build the country. “We have firm belief that we will also be successful in this regard as the people are with us,” she said. 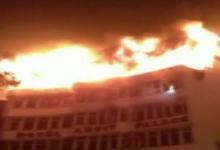 The prime minister in her hour-long speech also mentioned the destructive acts like killing and arson attacks of the BNP-Jamaat nexus from 2013-2015 and their atrocities on the people after the 2001 general election. At the outset of her speech, she paid rich tributes to Bangabandhu, the four national leaders, martyred freedom fighters as well as party leaders and workers who sacrificed their lives for restoration of democracy in the country. 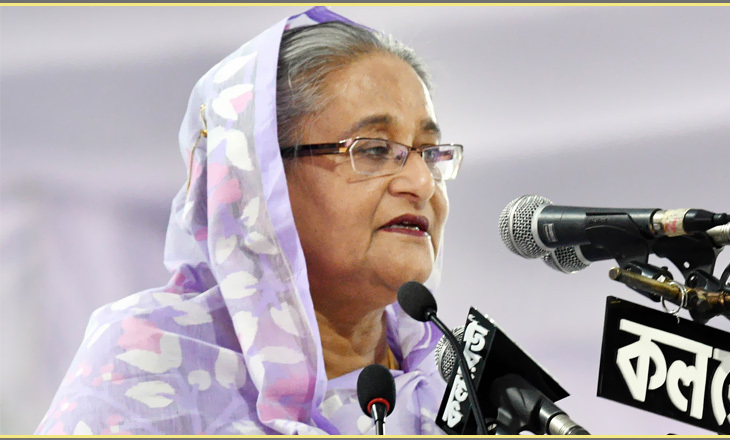 Sheikh Hasina dedicated her all achievements to the people of the country and expressed gratitude to all concerned who extended cooperation to her to bring these successes. The premier said she had to go through many hurdles and this barriers came time and again. “I had become victims of conspiracy inside and outside of the house, but I never compromised my ideology and principles,” she said. 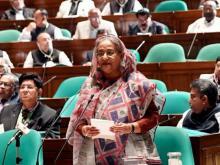 Sheikh Hasina said she crossed the hurdles keeping her ideology ahead to materialise the dream of Bangabandhu. “I’ve to fulfill my father’s dream and I’ve no objection if it takes my life,” she said. Reiterating her determination to build a hunger and poverty-free Sonar Bangla as dreamt by the Father of the Nation, the premier said her government is implementing the plan of advancing the country and it will continue to execute the plan. Mentioning that she works every moment for the country and people, Sheikh Hasina said she takes only five hours of the day for sleep. “I work every moment for the country and the people. Beyond this I’ve no work and … I don’t go any festival and my only thinking is development of the country and people,” she added. Sheikh Hasina said she will continue to work for changing the fate of the people and serving them till she remains alive. “The soul of my father will rest in peace for my works and he will see from the heaven that his country’s people stay well and their life has been changed,” she said. The prime minister said her government took steps to introduce bullet train on Dhaka-Chittagong route and purchase seven more modern aircraft for further development of the communication system. Earlier, a cultural function was also staged where noted singer of the country Mamtaz first performed songs which was followed by a ‘Geetinatya’ titled ‘Amar Priya Bangladesh’ presented by Sadia Islam Mou and the artistes of Bangladesh Academy of Fine Arts (BAFA). Artistes of ‘Nandan Kala Kendra’ also performed songs and recited poems with dance dedicating to the prime minister. The main part of the function commenced with recitation from the holy books — the holy Quran, Geeta, Bible and Tripitak. AL Publicity and Publication Secretary Dr Hasan Mahmood and Deputy Secretary Aminul Islam Amin conducted the main part of the reception, while party’s Cultural Affairs Secretary Ashim Kumar Ukil conducted the cultural function.